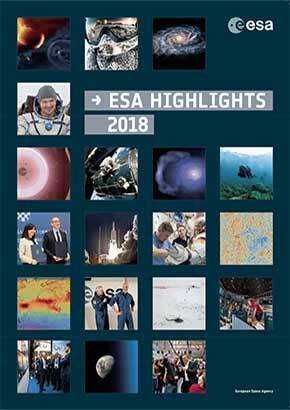 ESA Highlights is a visual showcase of some of ESA’s key achievements over the preceding year. 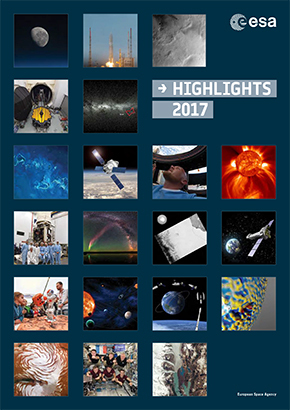 Colourful and informative, it is packed with amazing space photos and reveals how ESA really is active in every area of the space sector. We started 2018 with new ideas and busy preparations for new missions. ESA also celebrated some past successes! Spring was packed with missions and more! Highlights included Gaia’s second data release and ESA Astronaut Alexander Gerst boarded the International Space Station for the second time. In summer we celebrated the 100th launch of Ariane 5 from Europe’s Spaceport and ESA’s new wind-measuring satellite Aeolus got to work. Gerst returning to Earth after his Horizons mission was the perfect end to a year of incredible ESA achievements. 2017 got off to an inspiring start with a successful outcome for ESA’s ambitious new Aeolus satellite. Space debris, climate change and big plans for our future in space made the second quarter of the year very busy for ESA. The third quarter of the year saw new missions begin, plus a fond farewell to the amazing Saturn mission, Cassini. We ended the year with the launch of four more Galileo satellites and a parting gift from ESA’s comet mission Rosetta.